When the markets closed on Tuesday, they were mostly flat on a weekly basis while S&P500 was trading -9.87% on a monthly basis. 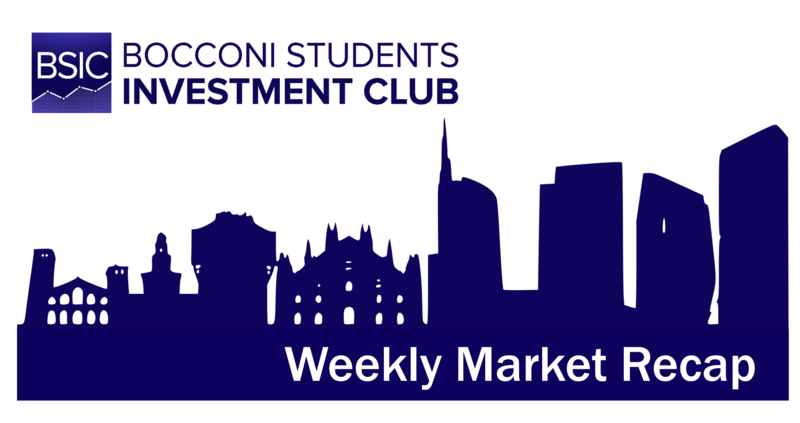 Starting from Wednesday the stocks started to recover from the recent sell-off as S&P gained 37.44 points while the DOWJ gained 361.94 points. S&P Materials index was the best performer among S&P sectoral indices as it gained 4.08% during this week, Materials index’s highest capped company Dow Du Pont rose by 8.95%. Among tech stocks, Apple saw a 5.08% sell off as Apple’s CFO announced that they would stop releasing unitary sales numbers. Energy stocks such as Exxon Mobile and Chevron also had a good week as Exxon rose by 5.07% and as Chevron rose by 2.74%. Overall this week has been the best week in terms of S&P and DOWJ performance over the last month. This is probably being caused by the investors buying the dip after the sell-offs and particular stocks are benefiting good news from their earnings calls. US 10-years T-Bonds stood at 3.21% on Friday. Bloomberg Dollar Index stood at 96.5420 as the markets closed. Political news effecting the markets during this week included the announcement of new sanctions by USA against Iran on Thursday, and reports that Trump wants to negotiate a draft trade agreement with China, following a tweet from the President, which pushed stocks higher globally. Next week Americans are going to vote for the midterm elections. Trump and his political agenda will be on the ballot as the congressional majority is vital for the Trump White House to pursue their political agenda which includes further tax cuts, deregulation and defending the president against further investigations. If polls are accurate Democratic majority in the house and a Republican majority in the Senate is likely. If Democrats gain the majority at both senate and house market turmoil might come as political instability will surge. However, if Republicans can successfully defend the house and increase their lead at the senate a new tax reform and deregulation might fuel the markets. If the polls prove to be accurate volatility will not surge as it might in a Democrat takeover of both the House and the Senate. On Thursday, the Bank of England decided to keep the key interest rate at the current 0.75% level, as expected, while stating that a “smooth” Brexit could quicken its rate-hike cycle. On the contrary, Mr. Carney, BoE governor, stated that the effects of a hard Brexit over interest rates are unpredictable, and rates could move both ways in such scenario. It also lowered GDP growth forecast for 2019 by 0.1% to 1.7%. On the same day, rumors concerning the agreement of a Brexit deal on financial services cause the pound to soar against all major currencies. Overall, the pound appreciated by 1.33% against the dollar and by 1.18% against the euro, with the USDGBP at 0.769 and the EURGBP at 0.878. A key figure to understand next trends will be the quarterly GDP figure which is going to be published on Monday. The FTSE 100 was up 2.2% week-over-week to 7094.12, led by the gains of BT Group (+15.27%) and Standard Chartered (+10.81%), both announcing above-expectations quarterly results. It is also worth mentioning how two big UK banks, Barclays and Lloyd’s, ranked as last and penultimate, respectively, in the stress test carried out by the European Banking Authority, while still passing it. The test checks the abilities of banks to remain solvent in a set of adverse scenarios. European equities posted the highest weekly gains since December 2016, with the Eurostoxx 600 Index surging 3.33% over the week to 364.08. The news about the meeting between Xi Jinping and Donald Trump were enough to spread positive sentiment across markets about an easing of trade tensions. On Wednesday, the ECB published inflation data showing the eurozone inflation rate at a six-years high to 2.2%. The EUR/USD exchange rate was almost flat over week at 1.139, while the euro appreciated 0.84% against the yen with the EUR/JPY at 128.92. Furthermore, this week both France, Italy and Spain released quarterly GDP figures. While the growth rate of the Spanish and French economies came out as expected, at 0.4% and 0.6% QoQ, respectively; Italy’s figure came up short of expectations. Indeed, it reported 0% growth, raising even more doubts over the country’s ability to meet the overly optimistic 1.6% GDP growth target for 2019 set by the new government. Nevertheless, the FTSE MIB is up 3.78% over the week to 19,390 points thanks to the positive news coming from the stress tests, in which Italian banks performed better than expected, and all passed the test. The elections that took place in Hesse, one the German Länder, last weekend led to the resignation of Angela Merkel as the leader of the CDU party, a role she had retained for over 18 years, and she stated she will not seek re-election as chancellor in the 2021 federal elections. This follows a disastrous election turnout both in the Hesse and in the Bavaria states, in which CDU and CSU, the Bavarian sister of the CDU party, lost for the first time the majority in the regional parliament. All these causes a new spring of leadership uncertainty for the party, and doubts over the strength of the Größe Koalition government to stay in place until 2021. The markets reacted positively to that, with the DAX closing 1.20% higher on Monday and scoring +2.84% over the week, as markets see the Merkel stepdown as a way to halt the vote bleeding of the CDU and to stop the growth of the populist AfD. The Chinese Yuan started the week near the important level of 7 as it stood at 6.96 at Monday. The Chinese economy is suffering from the trade tariff actions of the US administration. As of Friday, the USD/CNY rate stands at 6.89, relatively stronger as the news of a potential Trump decision to draft a trade agreement with China came out. As the Yuan gained slight strength with the news flow, the Shanghai Composite followed the Yuan’s trend as well. Within this week SHCOMP performed +2.99%. Upcoming days and the news flow will be important as a real trade agreement possibility may benefit both the Chinese equities and currency. The MSCI EM ETF started the week with 39.02 and gained 1.80 during the week marking a 4.61% rise. The 4.87% rise in the MSCI South Korea ETF also signals that Emerging Markets are outperforming American and European counterparts as the October sell-off ends. Turkey, another EM that has been under focus, has performed good during this market recap’s coverage week as TRY appreciated 2.34% against the rising USD. The exclusion of Turkey from American sanctions against Iran was important for this move. Next week and upcoming days will prove fundamental for the EM performance as recent trade war news and political relationships of US with emerging countries have an important impact on EM assets. Brent Crude started the week with 77.64 USD and finished the week with price 72.83 USD. The oil prices may see the effects of the Iranian sanctions that US imposed as the Iranian supply’s access to oil markets will get restricted. Another important driver for the oil prices is the WTI/Brent Crude ratio which was 0.91 as of Thursday and ended the week at 0.86. Macroeconomically this ratio can be expected to return to historical levels; however the duration for that normalization is not easy predict, so this ratio should also be observed closely while looking at oil prices. US Midterm elections are also important for oil prices as US is currently the largest oil producer and as Democratic policy against oil and other fossil fuels are seen as negative: a Democratic House and Senate might affect American energy policy.